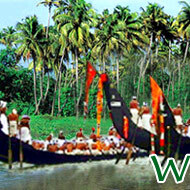 Offering Kerala holidays tour/travel package. 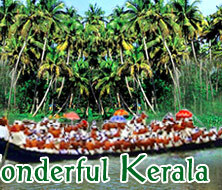 Travel to Kerala with us and make your holidays in Kerala a memorable one! Kerala is home to numerous religious and pilgrimage destinations. These places are thronged by millions of devotees. Holidays in Kerala are truly incredible. Kerala is located in the southern most part of the Indian mainland; the backwaters and Ayurveda make it a perfect holiday destination in India. For its natural beauty and greenery, the National Geographic Traveler has listed Kerala in its one of the ten 'Paradises Found'. It is a land acclaimed for the contemporary nature of its cultural ethos, and also appreciated for its soothing and rejuvenating feel. With the Arabian Sea in the west, the Western Ghats towering in the east, Kerala enjoys distinctive geographical features that have made it one of the most sought after holiday/travel destinations in India. There is just so much here to offer to people of all tastes and preferences. A long shoreline with serene beaches, tranquil stretches of backwaters, lush green hill stations, exotic wildlife, waterfalls, sprawling plantations, paddy fields and Ayurveda invite you to plan your holidays in Kerala. But theres more to it than meets the eye. Kerala is rich not only in its natural beauty but also in history, which goes back to the late Neolithic era (5000 BCE) and culture, that is without a doubt one of the richest and liveliest that youll see in India. This land even founds a mention in the Indian epics- Ramayana and Mahabharata mention the land. For the wildlife adventurers and enthusiasts, Kerala is truly a paradise, as 25% of Indias 10,000 plant speciesflowering and medicinal-are found here alone. The presence and diversity fauna here too isnt less marveling. With around 1000 different species; mammals, birds, reptiles, amphibians, fish combined, Kerala can literally be termed as a haven and heaven for the the wild. The same thing goes for beach and backwater lovers as Kerala offers tremendous opportunities for fun and adventurous activities. As you land up in Kerala for your holiday tour, you will find the equable climate of the place making your holidays in Kerala more memorable and enchanting. Holidays in Kerala also offer you "Ayurveda", the sacred knowledge of life and ancient system of medicine that originated in India. Ayurveda therapies and treatments rejuvenate the body and mind. It is advisable that when you plan your holidays in Kerala next time, make sure to look into Ayurveda to reap its benefits. If its still not enough, Kerala is also known for its rich cultural mosaic, studded with landmark monuments, forts, memorials, palaces and places of worship. While in Kerala, enjoy the passion of festivals and celebrations like Onam and Pooram, which will make your Kerala holiday tour a more fascinating one! 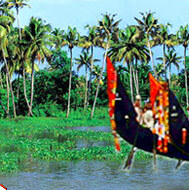 All these facets of Kerala make it a complete holiday destination. Come and plan your Kerala holidays with us!